On Saturday, 4 October 2008, during the opening session of the 178th Semiannual General Conference, Thomas S. Monson, then President of The Church of Jesus Christ of Latter-day Saints, announced the building of a temple in Rome, Italy. The two-spired, three-story, 140-foot Rome Italy Temple is located in northeast Rome near the Grande Raccordo Anulare, the circular road (beltway) that surrounds the city, at Via di Settebagni, 376, just 11 miles from Saint Peter’s Basilica, near the village of La Cinquina Bufalotta. Its architecture was inspired by ancient Rome. Architect Neils Valentiner said, "This had to be one that when you walked onto this site, every person should feel like they were on an Italian site. They would recognize it because of the materials, because of the design, and because of the surrounding." He also stated that the temple’s design was inspired by San Carlino, a Roman Catholic church in Rome. He said, "The curved ceilings, the curved walls, the expression of the colonnades and columns. And that started this very early concept of a curved church, a curved temple, and temple building both on the exterior as well as on the interior." The temple sits on 15 acres and will feature lush gardens, and a 40,000-square-foot temple with floor and ceiling designs to mimic Michelangelo’s Capitoline Hill plaza overlooking the Roman forum. It is part of a religious and cultural center that includes a multifunctional meetinghouse, a visitors’ center, a family history center and housing for visitors. Marble from Italy, Spain, Turkey, and Brazil is being used to decorate the interior and exterior spaces. The exterior finish will be made of Sardo Bianco granite quarried and fabricated in Italy. A charming Italian Villetta, which stood at the highest point of the temple site, was razed to make way for the Rome Italy Temple. The Villetta served for a time as an apartment for the full-time missionaries. 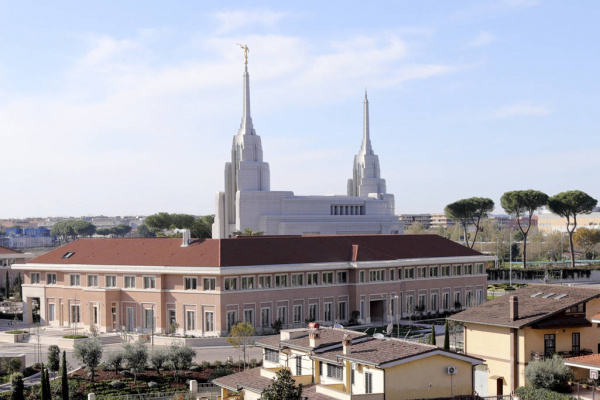 The Rome Italy Temple will be the first LDS temple constructed in Italy and the 12th temple in Europe. There are more than 30,000 members of The Church of Jesus Christ of Latter-day Saints in Italy, with seven stakes and two missions. 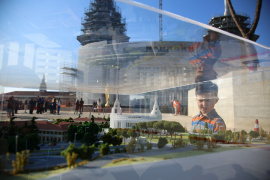 The construction plans for the Rome Italy Temple site also includes a Stake Center meeting house (a stake being roughly similar to a Catholic diocese), a Visitors' Center that houses digitally reproduced marble replicas of Bertel Thorvaldsen’s renown sculptures of Christus and the Twelve Apostles, a Family History Center, and patron housing. The Rome Italy Temple serves members who, according to local Rome Stake President, Massimo De Feo, traveled to the Bern Switzerland Temple to do temple work. The Daily Beast.com reports, "Italy has 103 Latter-day Saints congregations under 10 stakes, divided into missions based in Milan and Rome, with the highest concentration in the north of Italy, where 53 percent of Mormons live, compared to 29 percent in southern Italy and 18 percent in the central regions. Sicily alone has 3,052 members of the Church; the region around Rome has 2,117, according to the LDS Italy archives. There are more female Mormons (53 percent) than men (47 percent) in the country." President De Feo says that the Church has seen a significant increase in requests for baptisms for the living and the dead, and for celestial marriage ceremonies and family sealing ceremonies which officially bind couples or families together for eternity. 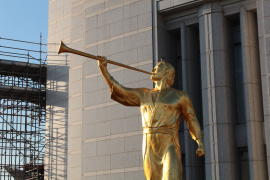 He also believes that many Italian members who moved away because of inadequate ways to practice their faith will return to Italy once the temple is complete. President Monson dedicated the temple site on Saturday, 23 October 2010. He was accompanied by Church officials including Elder William R. Walker, Executive Director of the Temple Department; Erich W. Kopischke, President of the Europe Area and his two counselors, Elder Gérald Caussé and Elder José A. Teixeira; Elder Alfredo L. Gessati, Area Seventy; President Massimo De Feo, Rome Italy Stake President; and President Raimondo Castellani, Bern Switzerland Temple President. Numerous government officials were also in attendance including Mr. Giuseppe Ciardi, vice mayor of Rome, and Senator Lucio Malan. During his remarks to the 500 guests at the groundbreaking ceremony, he said, "My heart is filled with gratitude. Members throughout Italy and the entire Mediterranean area will be able to come here." Senator Lucio Malan commented that it was "A ceremony that profoundly touched me for the sincere and heartfelt appreciation of those attending. A positive day for Italy because those who profess to obey the laws of the state and the laws of God make the country in which they live a better place." Shortly after ground was broken for the temple, Rome Mayor, Gianni Alemanno, visited the temple site with Elder José Teixeira of the Quorum of the Seventy. According to a report on the Mormon Newsroom website, Mayor Alemanno, an environmental engineer, "was impressed with the Church’s high construction standards and materials, including the systems employed to manage water consumption, electrical production and the low environmental impact of the temple complex." The full story is available on the Italy Mormon Newsroom website. During a visit to Europe in the summer of 2014, President Dieter F. Uchtdorf, Second Counselor in the First Presidency, spent some time at the site of the Rome Italy Temple. He commented, "The Rome temple is significant for the Church in Italy, not only for its physical presence but also as a monument to the growth of the Church. For centuries, Rome has been the Christian hub throughout the world." The growth of the Church in Italy has not been without its opposition. Just three years after the Saints arrived in the Salt Lake Valley, the first missionaries arrived in Genoa, Italy, on 25 June 1850, including Elder Lorenzo Snow, who would become the fifth president of the Church. Over the next three years, 221 people were baptized and organized into three branches. But most proselytizing in Italy stopped in the early 1860s in the face of local opposition and because of a request from Church leaders for Italian members to migrate to Utah. An attempt to reopen missionary work in Italy in 1900 was refused by the government. The Church was finally reestablished in Italy in 1951, following the conversion of Vincenzo di Francesca, who happened to discover a charred copy of the Book of Mormon in a garbage bin. The cover and title page was missing, and it took him years to find out the identity of the book and achieve baptism into the Church. Italians who had joined the Church in other countries began to return to Italy during this period. They attended Church with LDS serviceman stationed in Italy in various branches. By the end of 1964, Church records showed 229 members in Italy. That same year, Elder Ezra Taft Benson, an apostle who would become the 13th president of the Church, petitioned the government for permission to resume missionary work. Permission was granted, the mission was re-opened, and missionaries began to proselyte on 27 January 1965. By 1978, membership had grown to over 7,000 and increased to 14,000 by 1990. Today there are over 22,600 members organized into 10 stakes and one district. On 30 July 2012, the Italian government legally recognized Mormonism as a religion in Italy and full "partner of the state." The Prime Minister had given his approval in 2007 but a vote in the affirmative from parliament was still needed. Qual è il Libro di Mormon? Il Libro di Mormon è un altro testimone di Gesù Cristo e conferma le verità trovate nella Sacra Bibbia. Lungi dal minare la Bibbia, il Libro di Mormon sostiene la sua testimonianza di Gesù Cristo. Quale compagno della Bibbia, il Libro di Mormon è un testimone della divinità di Gesù Cristo e del Suo ruolo quale Salvatore del mondo. Il Libro di Mormon restaura le verità chiare e preziose che nella Bibbia sono andate perse. Quando studiamo il Libro di Mormon, viene chiarita la nostra comprensione delle dottrine contenute nella Bibbia. 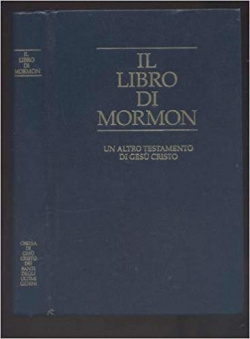 Un passo dice che il Libro di Mormon "E l’angelo mi parlò, dicendo: Questi ultimi annali, che hai visto fra i Gentili, confermeranno la verità dei primi, che sono dei dodici apostoli dell’Agnello, e faranno conoscere le cose chiare e preziose che ne sono state tolte; e faranno conoscere a tutte le tribù, lingue e popoli che l’Agnello di Dio è il Figlio del Padre Eterno e il Salvatore del mondo; e che tutti gli uomini debbono venire a lui, altrimenti non possono essere salvati" (1 Nefi 13:40). Riferimento: Il Libro di Mormon e la Bibbia. Rome, the Eternal City, known for the wonders of its ancient statues and as the world headquarters for Catholicism, has been graced with an even more impressive statue. 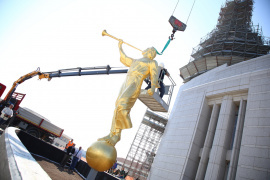 On Saturday, 25 March 2017, a 13-foot-tall, 450 pounds, gold-leaf-covered Angel Moroni was installed atop the still-under-construction Rome Italy Temple. 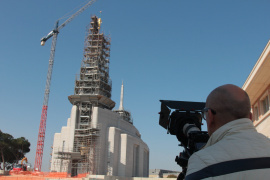 In a ceremony that lasted more than an hour, an invited audience of approximately 150 people comprised of local leaders of The Church of Jesus Christ of Latter-day Saints, construction supervisors, and their families, and a handful of Rome and national media representatives witnessed a crane lifting the iconic statue 150 feet in the air and placing it in place atop the temple. The Executive Director of the Temple Department for The Church of Jesus Christ of Latter-day Saints, Larry Wilson, commented, "The Eternal City is known for its history, its beauty and as a place of worship and faith. We are so pleased to add our sacred temple to this Christian tradition." Silvia Rodio, the wife of Francesco Rodio, President of the Puglia Italy Stake, commented, "It’s a great emotion, a feeling of gratitude that I’ve been feeling today. Five hours may seem long, but it's a far cry from the 14 hours it takes to drive from Bari and the Puglia northwest to the Bern Switzerland Temple, the closest temple option for the Latter-day Saints in Italy. We’ll soon have more of an opportunity to attend the temple and to receive more often the blessings of the temple." An official completion date for the Rome Italy Temple has not been set. The Rome Italy Temple reached another benchmark this week as the marble statue of the resurrected Christ, an exact replica of the original Christus statue produced by Danish artist Bertel Thorvaldsen in Italy before its placement in Denmark in the early 1800s, was placed in the Visitors' Center. Along with the statue of Jesus Christ, statues of the original Twelve Apostles were also placed in the Visitors' Center. The replicas of the Twelve Apostles were digitally measured and fashioned to be precisely the same as the originals, and the marble used was taken from Cave Michelangelo, the quarry in Carrera, Italy, where the marble for Thorvaldsen’s original sculptures was mined. In the video, Director of Public Programs for The Church of Jesus Christ of Latter-day Saints, Mark Lusvardi, commented, "One of the things that were as important to us was to do something that would make this part of the country but more importantly for recognizing the Savior, Jesus Christ. What a perfect symbol of the Savior and our belief in Him could we do than to bring that here to this place." He continues, "That’s also part of the message of the whole Visitors' Center here. We’ll learn not only about Christ and the calling of the original Twelve but we know that we have prophets and apostles today." The original statues are housed in the Church of Our Lady in Copenhagen, Denmark, nearly 1,000 miles away from the Rome Italy Temple. 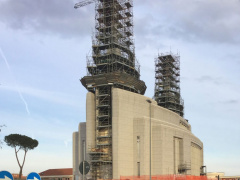 According to LDS Living, "The Rome Italy Temple has undergone many visible and significant changes in its construction process, which has taken seven and a half years. 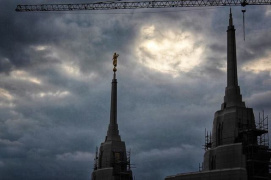 Late last year, more scaffolding was removed from the temple as landscaping continues to progress." 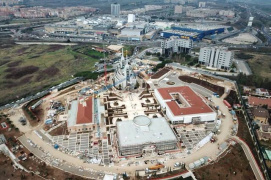 In February 2018, the first aerial pictures of the temple were released, showing the temple, the visitors' center, and the entire temple complex. More art glass has also been installed in the beautiful edifice. The pictures in the gallery below were retrieved via LDS Church Temples. Construction continues on the Rome Italy Temple. 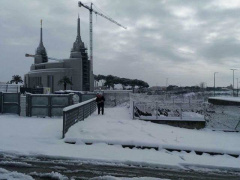 Rome Italy Temple construction continues in late February 2018. Mid-January 2018. Temple construction continues on Rome Italy Temple. The Rome Italy Temple will be open to the public for a free public tour beginning Monday, 28 January 2019, through Saturday, 16 February 2019, excluding Sundays. Tickets will become available for the public open house near the beginning of January 2019 at templeopenhouse.lds.org. 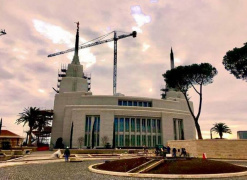 On Monday, 14 January 2019, journalists, community leaders, and government officials came from around the world to tour the new Rome Italy Temple. As part of media day, a press conference was held with Elder David A. Bednar and Elder Ronald A. Rasband of the Quorum of the Twelve Apostles. Elder Massimo De Feo of the Quorum of the Seventy, who is from Italy, joined them. The event begins at the 18:00 mark. The Latter-day Saint Life Hacker Facebook page recently shared a beautiful video of the Rome Italy Temple. Speaking about the temple, President Russell M. Nelson said, "The sacred ordinances performed in this holy temple will unite families for eternity. God loves all His children equally and has provided a way for them to be linked in love, generation to generation. We are thrilled to be able to dedicate a temple in this city replete with historical importance throughout the ages." 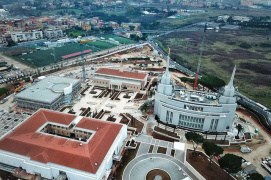 Of the Rome Italy Temple, the 162nd operating temple of The Church of Jesus Christ of Latter-day Saints in the world, Elder David A. Bednar of the Quorum of the Twelve Apostles and chairman of the Temple and Family History Department said, "It is beautiful. The craftsmanship is expert and perfect." The Church of Jesus Christ of Latter-day Saints announced that the Rome Italy Temple will be dedicated on Sunday, 10 March 2019, through Tuesday, 12 March 2019. On Friday, 8 March 2019, The Church of Jesus Christ of Latter-day Saints made a historic announcement in a news release. For what is believed to be the first time in the 188-year history of the Church, the entire First Presidency and Quorum of the Twelve Apostles are assembling outside the United States. President Russell M. Nelson and other leaders will dedicate the Rome Italy Temple in seven sessions on Sunday, Monday and Tuesday - 10 March through 12 March 2019. 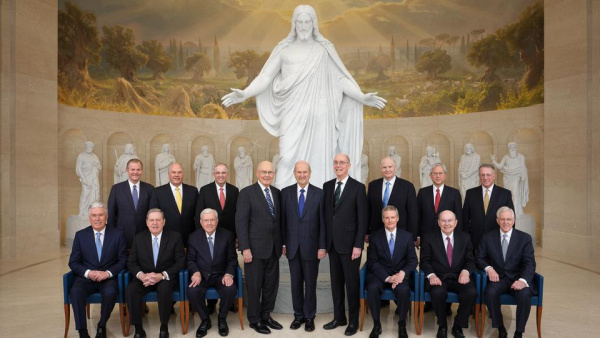 As the Deseret News reports, "Full meetings anywhere outside Utah are rare for the 15 senior leaders considered prophets and seers by 16 million church members." According to Church historians, the last time every member of both bodies gathered away from church headquarters was in 2002 when they all attended a temple dedication in Nauvoo, Illinois. 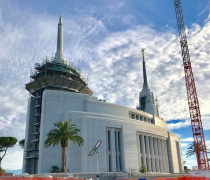 Deseret News further reports, "That marked the first time the entire leadership had traveled to one place outside of Salt Lake City, Utah, since 1956, when church historians say they dedicated the Los Angeles California Temple, the 10th temple dedicated in the church’s history." Ron Esplin, general editor of the Joseph Smith Papers, stated that the closest equivalent outside the United States happened 178 years ago, when nine apostles led meetings in Manchester, England. For Latter-day Saints, an apostolic trip to Rome is comparable to the ancient apostles Peter and Paul, who reportedly preached in Rome and, according to legend, were imprisoned and executed in the Eternal City by the Roman Empire in about 64 A.D. In January 2019, Elder David A. Bednar and Elder Ronald A. Rasband traveled to Rome, Italy, and visited Mamertine Prison, the dungeon prison where reportedly Peter and Paul were held before their martyrdoms. The prison abuts the Roman Forum and is about 1,000 yards from the Colosseum. In a short video recorded outside the prison, Elder Bednar said, "Now more than 2,000 years later, Elder (Ronald A.) Rasband and I are privileged to stand here as modern-day apostles of the Lord Jesus Christ in The Church of Jesus Christ of Latter-day Saints." A temple is literally a house of the Lord," he said. "Each temple is a holy sanctuary in which sacred ceremonies and ordinances of the gospel are performed by and for the living and also in behalf of the dead. We build temples so our faithful members can visit often and receive the most sacred ordinances of our faith. Before our temples are dedicated for their sacred purpose, the public is invited to see the beauty of the temple and learn about the commitments we make there with God. On Thursday, 7 March 2019, The Church of Jesus Christ of Latter-day Saints released a new video about the Rome Italy Temple. The video features an introduction about Latter-day Saint temples by President Russell M. Nelson. In the video, Elder David A. Bednar and Elder Ronald A. Rasband of the Quorum of the Twelve Apostles give a brief tour of the temple, showing and discussing the various rooms and areas in the temple, which mirror what is found in all Latter-day Saint temples around the world. These include the baptistry, instruction rooms, the bride’s room, marriage sealing rooms, and the celestial room. The Rome Italy Temple of The Church of Jesus Christ of Latter-day Saints is now dedicated. On Sunday, 10 March 2019, Church President Russell M. Nelson conducted the symbolic cornerstone ceremony, which signifies the temple’s completion and readiness to be dedicated for sacred use. The ceremony is also symbolic of Christ as the chief cornerstone of the Church. 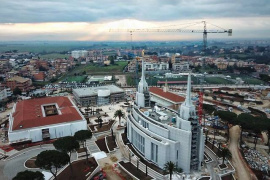 The Rome Italy Temple is the Church’s 162nd operating temple, with another 40 announced or under construction. During the ceremony, President Nelson said, "We will now proceed to finish the work of the temple. We’ll put some cement in the cracks. To be honest with you, they’ll have to erase what we’ve done, and do it all over again." Children were also invited to place the mortar, including 7-year-old Elena Malara of Monterotondo, Italy. She said, "I’m happy because I put the mortar in the stone." Her father, Federico Malara, said, "We had the beautiful occasion to come to the dedication of the Rome Italy Temple. For us, this is a great joy as a family." Elena’s mother, Maria Irma Curatola Malara, added, "We feel very emotional. Our daughters had an opportunity to see President Nelson and enjoy this beautiful spirit. This experience will remain in their hearts forever." There were seven dedicatory sessions conducted. President Nelson attended and gave the dedicatory prayers in each of the three sessions on Sunday, 10 March 2019, and Elder Massimo De Feo of the Seventy conducted each session. There were also two dedicatory sessions on Monday, 11 March 2019, and two more on Tuesday, 12 March 2019. As the first of seven dedicatory sessions came to a completion, President Nelson offered the dedicatory prayer. He said, "In this ancient and great city that has stood since biblical times — in this historic nation of Italy — we acknowledge the ministry of two of Thy Son’s early Apostles, Peter and Paul, who once blessed this land with their labors. May the influence of their abiding testimony of Jesus Christ continue to be felt among the vital values of this great country." In continuing his prayer, he said, "We are grateful for the support of the church, government and civic leaders who have offered much-appreciated goodwill in our desire to build this holy temple here in Rome. Wilt Thou bless them for their kindness and fortify their continued desire to preserve religious liberty for all." This page was last edited on 13 March 2019, at 08:44.